This lab is open to creators, writers, choreographers, dramaturgs and interdisciplinary performance artists. This 5-day laboratory is a gathering of dramaturgs from various disciplines to exchange best practices and fundamental aspects of live art. 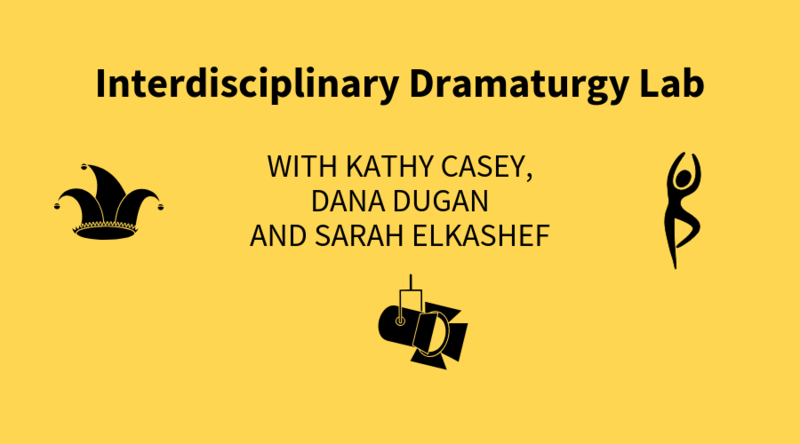 Led by Kathy Casey (dance), Dana Dugan (circus) and Sarah Elkashef (theatre), the lab is a space to exchange dramaturgical tools and challenges from an interdisciplinary perspective. 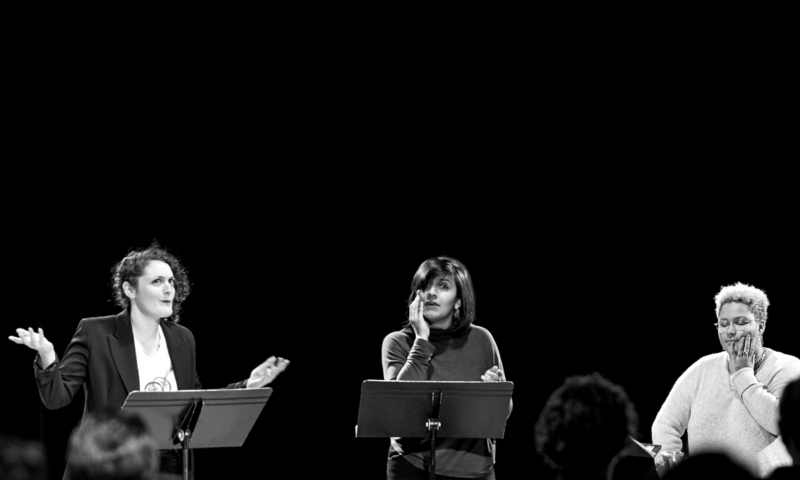 It is an opportunity to acknowledge dramaturgy as an art form. Application guideline: To apply for this training, please submit a bio, your CV, and a short (1-2 paragraph) statement explaining why this training interests you, how it is relevant to your artistic practice and what your expectations are for this lab. Born in North Carolina, Kathy Casey began her dance career in 1979 with the Chicago Moving Company. Settled in New York in 1980, she danced for many choreographers before joining the Lar Lubovitch Dance Company in 1984. In 1989, she became a member of Susan Marshall & Company, with whom she had collaborated since 1981. From 1985-1989, she also assisted Mr. Lubovitch and Ms. Marshall in creation. Kathy Casey has danced in Europe, Asia, and North America and continues to give numerous workshops across Canada and the United States. Welcomed by Montréal Danse in 1991, she was appointed Artistic Director of the company in March 1996. A major portion of her work now is collaborating with choreographers on the dramaturgy of the works created for the company. In addition to her work with Montréal Danse, she also works as an artistic advisor with independent choreographers in the city. Dana Dugan is an American circus artist, performer, pedagogue, and scholar based in Montreal. She was a founding member, programmer, project manager, and producer of the Chicago Contemporary Circus Festival and CirqueOFF. Dana recently completed her Master’s Degree at Concordia University under fellowship researching the circus body and its embodied knowledge. She will continue her research explorations and performance of the circus body and speculative performance narratives as a PhD student at Concordia, Fall 2018. Dana’s work reflects an agenda that advocates for socially conscious performances and alternative, queer, feminist, political narratives that cultivate agency on the circus stage. Sarah Elkashef is a theatre artist, primarily a dramaturg, working in new play development and interdisciplinary creation. At Playwrights’ Workshop Montréal she leads the Interdisciplinary Writer’s Lab in addition to various other projects. At the National Theatre School of Canada she often works across programs as a dramaturg, creator, and teacher and in 2016 received their Bernard Amyot Award for Teaching. Sarah recently co-created a circus show for families Eat Sweet Feet, and continues to work on High Z, an immersive performance installation for planetariums based on the 2011 Nobel prize winning discovery of the accelerating expansion of the universe. Prior to settling in Canada she was the Senior Reader at Soho Theatre in London, U.K. Sarah has also been an associate producer, company manager, literary associate and more in New York City. She is a graduate of Warwick University in English Literature and Theatre (U.K.), has an M.A. in Theatre from Hunter College (CUNY, NYC), and a Graduate Diploma in Communications from Concordia University (Montreal, Canada).